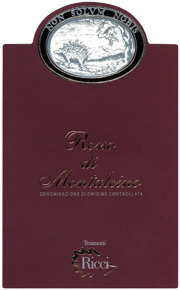 The Rosso di Montalcino DOC designation was created in 1984. Rosso di Montalcino is essentially a ‘baby Brunello’, made from the same grape variety (100% Sangiovese) grown in the same territory, but aged less than Brunello (minimum one year instead of four years). This allows producers an outlet for wines that they prefer not to age so long. Rosso is similar to Brunello in its aromas and flavors, but it is fresher, lighter-bodied, and easier to enjoy young. It’s a small step away from Brunello at a fraction of the price. Ricci Rosso di Montalcino boasts impressively intense and pure Sangiovese aromas. Medium-bodied with red berry, plum and slightly spicy on the palate. Enjoy with well with roasted or grilled meats, game, hearty pastas and all Tuscan cooking. Temperature-controlled fermentation for 10 to 12 days. In oak barrels for 1 year, then resting in bottle.